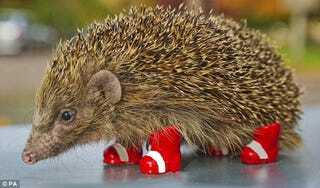 Britain's hedgehog population is in crisis, with many falling victim to roadkill. Sega staged a "hedgehog road crossing" to raise awareness of the creatures, and, of course, Sonic Colors. Here one's fitted with red booties. Seen via Daily Mail.